The Peavey 112 is a two-way speaker system built around a 12-inch heavy duty woofer and a RX™ 14 titanium diaphragm dynamic compression driver mounted on a 60x40 degree coverage constant-directivity horn. 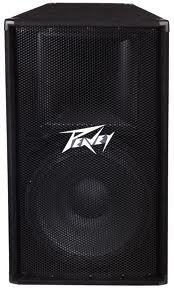 Peavey PV115 PA Speaker - 15 Inch, 400 Watts. 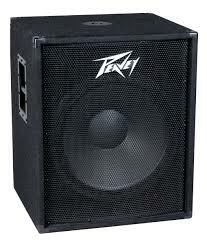 Peavey PV115 PA Enclosure (1x15 Inch 2 Way). It seems almost too good to be true but it this is the real deal! The Peavey PV115 is a full-range, 2-way PA speaker cabinet, which handles 400 Watts of power (program, 800W peak), with a wide frequency range, all for a nearly unheard-of price. Its typically rugged Peavey durability includes 3/4 inch MDF construction, metal handles, a full metal (not plastic!) grille, heavy duty carpet and Peavey's Sound Guard III HF driver protection network. Its components consist of one heavy duty 15 inch woofer and the Peavey RX14 1 inch compression driver on a large format horn for smooth vocal performance. 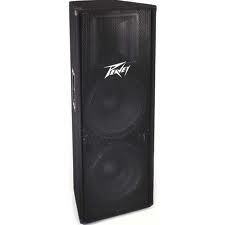 Peavey has seriously raised the bar in value-priced, high-performance PA speakers with the new PV115. 8 ohms. The PV115 has two 1/4 inch inputs so it’s ideal for chaining a pair (or more) of them together, to run from the same amp. 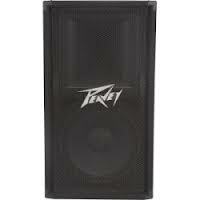 The Peavey PV215 PA Enclosure seems almost too good to be true but it is the real deal! The Peavey PV215 is a 2x15-inch, full-range, passive, 2-way PA speaker cabinet, which handles 700 Watts of power (program, 1,400W peak), with a wide frequency range, all for a nearly unheard-of price. Its typically rugged Peavey durability includes 3/4-inch MDF construction, metal handles, a full metal (not plastic!) grille, heavy duty carpet and Peavey's Sound Guard III HF driver protection network. Its components consist of two heavy duty 15-inch woofers and the Peavey RX14 1-inch compression driver on a large format horn for smooth vocal performance. Peavey has seriously raised the bar in value-priced, high-performance PA speakers with the new PV215. The PV215 has two 1/4-inch inputs so it’s ideal for chaining a pair (or more) of them together, to run from the same amp (refer to amplifier impedance capabilities). The Peavey PV 118D Powered Subwoofer is designed to complement the PV family of enclosures, this ported subwoofer utilizes an 18 inch heavy duty woofer with 3 inch voice coil, and 65 oz. magnet. Features a built-in class-D amp that drives an 18 inch woofer with 300 watts total power.